Players are part of the NorTec corporation, looking to mine the immensely valuable Xenosathem from a brand new planet. However, the local fauna (the Brood) also want to get at the Xenosathem, and they're not going to let some puny humans and some mining equipment get in the way. It will take all of your collected might, as well as the power of various troops and specialized gear, to make sure that the Xenosathem is acquired and secure. But more than just the Brood stands between you and your fortune. The very elements seem to be against you. Rain and fog will be major factors in how you approach the enemy (and how they approach you). Beware of what hides in the misty swamps. 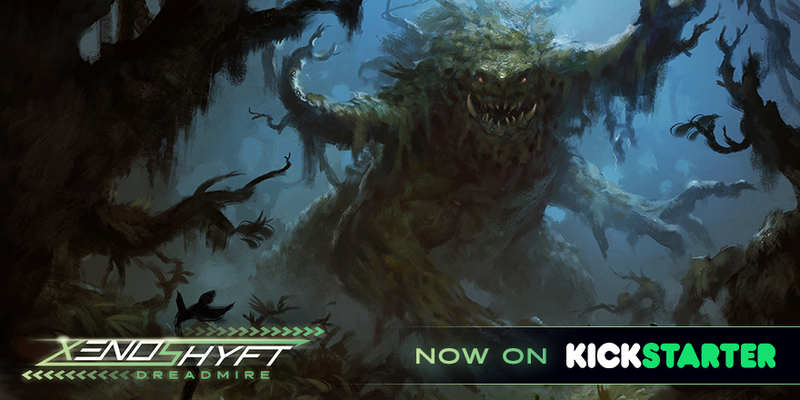 Dreadmire comes with over 400 new cards that, as I mentioned, can be used just on their own, or mixed in with your current XenoShyft sets to create an all-encompassing challenge. The campaign is up and running now and is set to go for another 18 days.